The abstract forms in each piece are a trace of Julia’s experiences as influenced by colour. She is inspired by colour and shape found in vintage illustration, fashion and interior design. 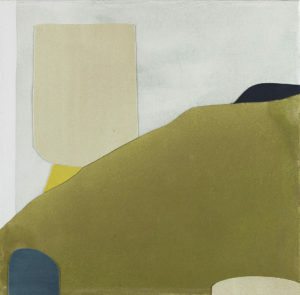 Her abstract paintings reflect her view on the importance of colour in its purest and most elegant form. She uses watercolour and paper to develop layers, and relies on colour to construct its own shape and find its place in a composition. Julia A. Balfour graduated from OCAD University in 2018 with a Bachelor of Fine Arts in Drawing and Painting, where she received the Fred Hagan “Passion in Painting” Award. In 2016, Julia studied at the OCADU campus in Florence, Italy. Since graduating, she has shown her work in local Toronto galleries and in the international art fair, Art Toronto.